Hanukkah Kids Ideas. Favorite Hanukkah Bingo Game Earned “A” Rating. 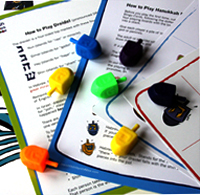 New: Jewish Holidays Games Bundle (with Hanukkah, Rosh Hashanah, and Passover games), Hanukkah Parent Pak and Hanukkah Thank You Notes. Free shipping for Amazon Prime members. WINCHESTER, Va. - Nov. 17, 2014 - PRLog -- Just in time for Hanukkah 2014, JewishHolidaysinABox.com announces its biggest offering ever of Hanukkah games, kits, educational materials, and digital downloads. Free shipping is available to Amazon prime members for all games, kits, and educational materials. Back for 2014: favorites Hanukkah Bingo Game (recipient of the coveted A rating from ToyTips.com), Hanukkah Games Box, and Hanukkah Family Fun Kit. New this year: Jewish Holidays Games Bundle (a combo of games for three key holidays, including Hanukkah Bingo, Rosh Hashanah Bingo, and Passover Seder Steps Follow-Along). Also new: Hanukkah Parent Pak, the perfect compilation of festival how-tos, and customizable Hanukkah Thank You Notes for little ones. Digital downloads include Celebrate Hanukkah: How to Light Up Your Holiday, Happy Hanukkah Art & Activity Pak, Hanukkah Blessings Tutorial, and Hanukkah Triple Play – a reduced-price bundle of all three Hanukkah downloadables. All downloadables are available from JewishHolidaysInaBox.com. Jewish Holidays in a Box, LLC is the brainchild of marketer/teacher/writer Ellen Zimmerman whose passion is to create materials and community to inspire and empower Jewish and interfaith families to celebrate Jewish holidays with more joy. Visit http://www.jewishholidaysinabox.com/jewish-holiday-traditions/how-to-celebrate-hanukkah/ for more information. Sign up at http://www.JewishHolidaysInABox.com for free blog posts with recipes, how-tos, and discounts. JewishHolidaysInaBox is also active on Pinterest http://www.pinterest.com/JewishHolidays, Facebook (facebook.com/JewishHolidaysInABox), and Twitter (@JewishFamilyFun).